Weather: Amazingly Good. Strong breeze from SW across route, Sunshine, hazy at times. 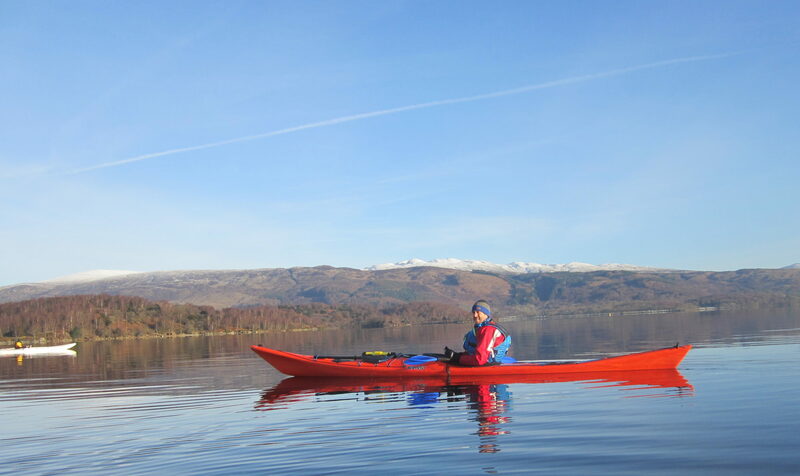 Report: This was originally planned as a simple beginners trip across Loch Long. The last email reads “The wind forecast for 9 until midday is now Force 5 with Force 8 gusts with quite heavy rain. Even on the canal it would be unpleasant at the very least. However I am very reluctant to cancel and the wind is meant to drop quickly in the afternoon so I suggest an afternoon trip. I am still worried about Loch Long (F6 gusts forecast) and have tried to think of alternatives. 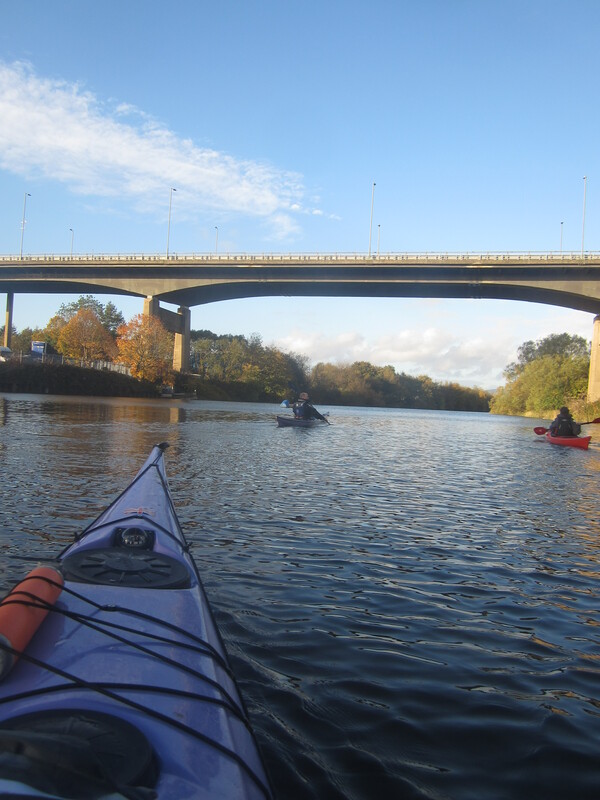 It is a very high tide at 3pm so my suggestion is a paddle from Erskine Bridge up the Clyde and River Cart right into the centre of Paisley. 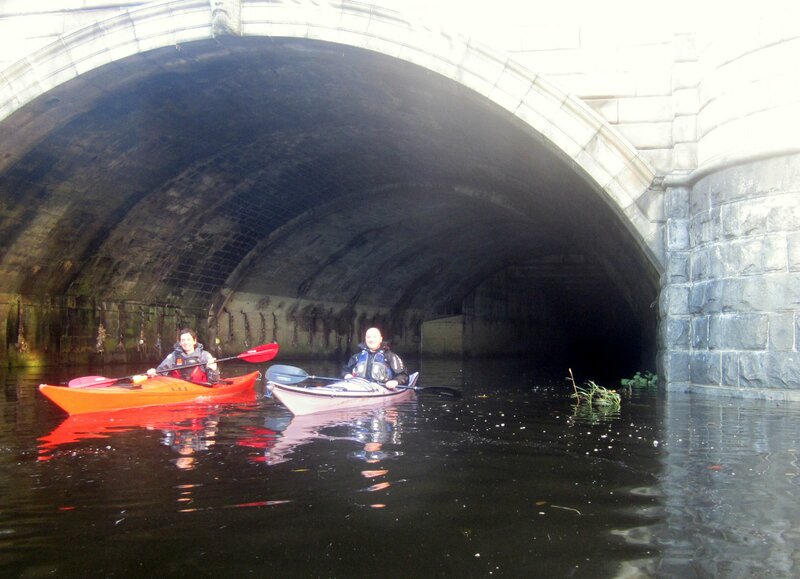 If we time it correctly we can kayak through the tunnel underneath Gilmour Street to the weir by the Abbey/Mill” . Sadly only 3 of the original 10 could make the revised timings and/or felt they were up to 20km in 5 hours. The beach adjacent to the Boden Boo Car Park is an excellent launch point, with soft yellow gently shelving sand. 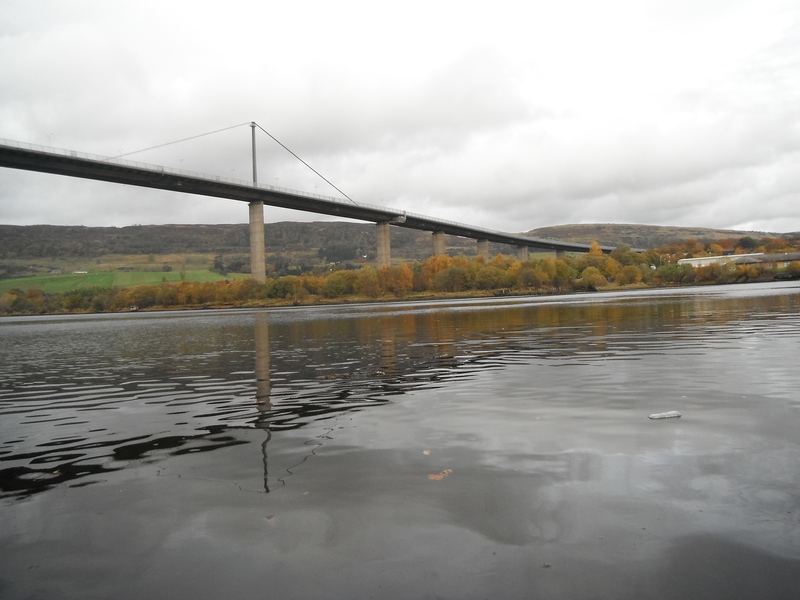 The river (Clyde) is wide and grey with open grass/marsh areas to the south and industrial building to the north and the incoming tide easily countered any current. 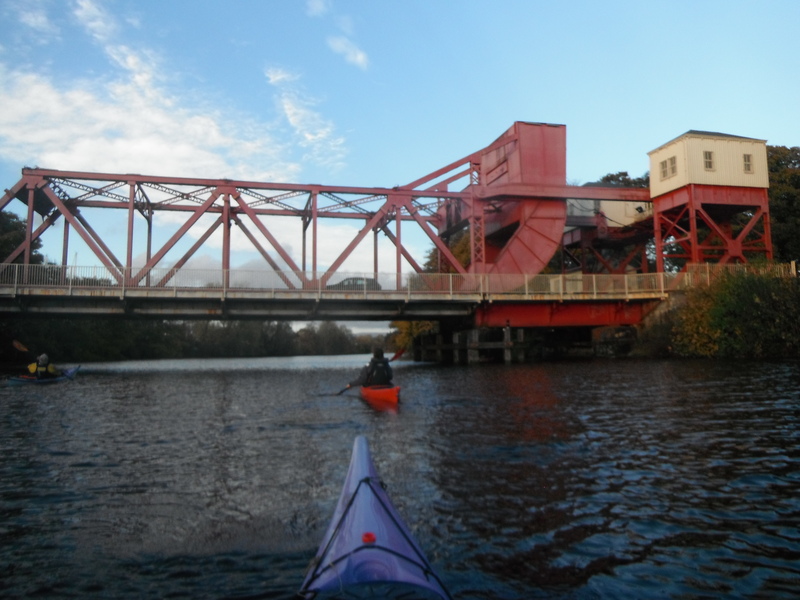 A very pleasant paddle down to the Titan Crane at Clydebank where we passed the only other craft on the water. 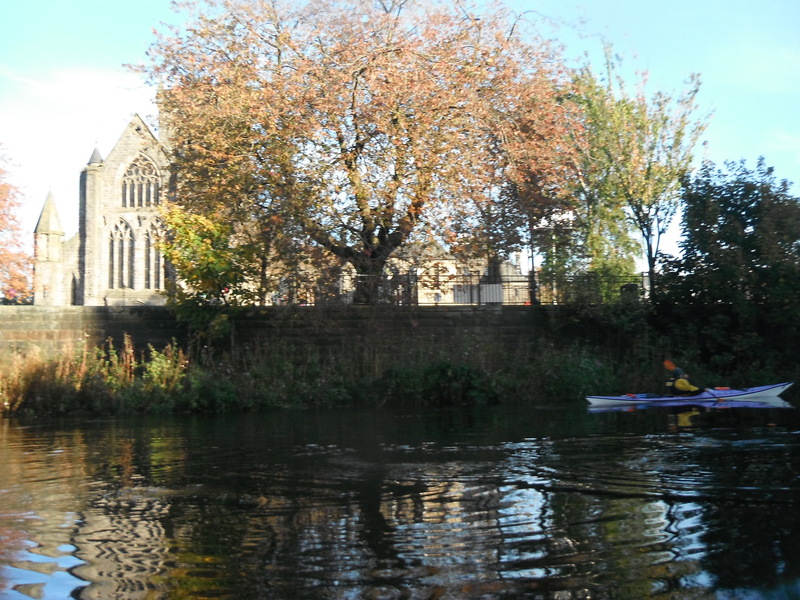 Opposite the college we turned up the River Cart for about 1km where it splits between the White and Black Cart. 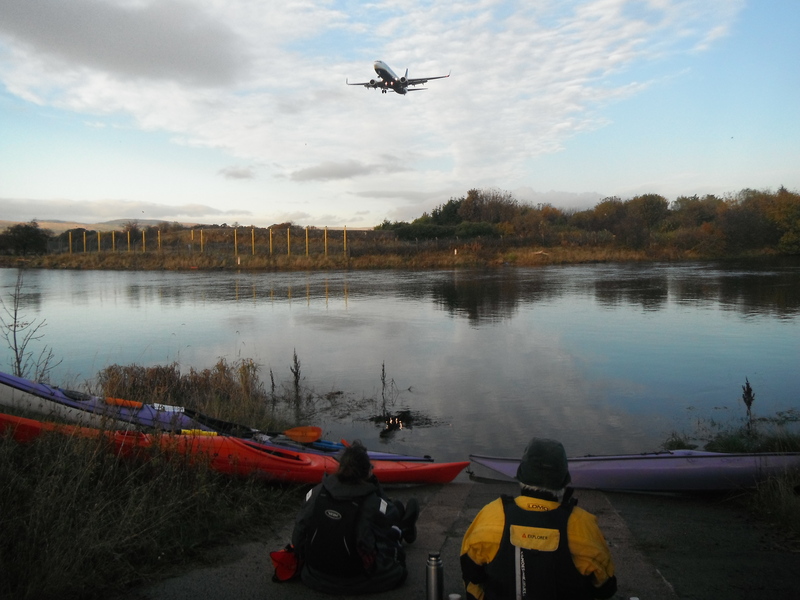 The former runs up through Paisley and on to Pollock whilst the Black Cart flows through Johnstone from Castle Semple Loch. 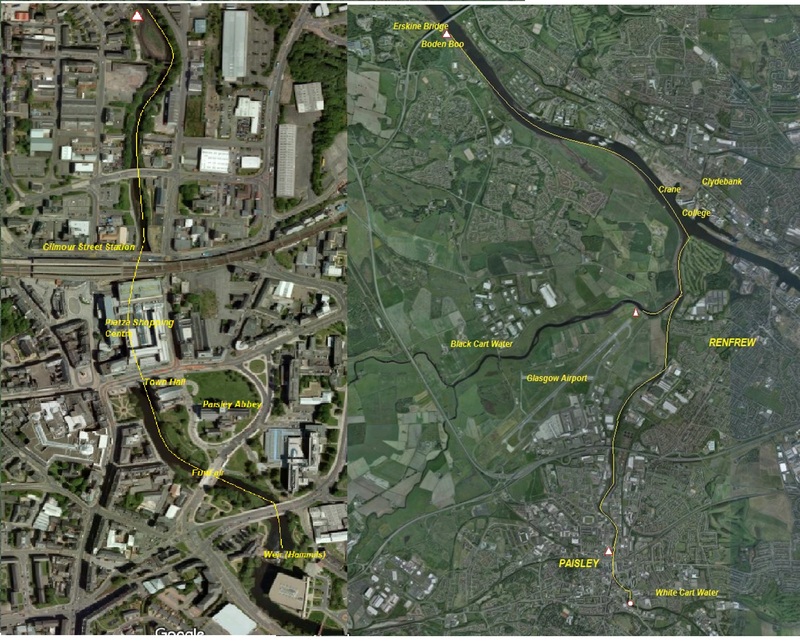 The main features of the river until Paisley are the (Ugly?) Lift Bridge, a number of factories and the difficulty in getting off the water. 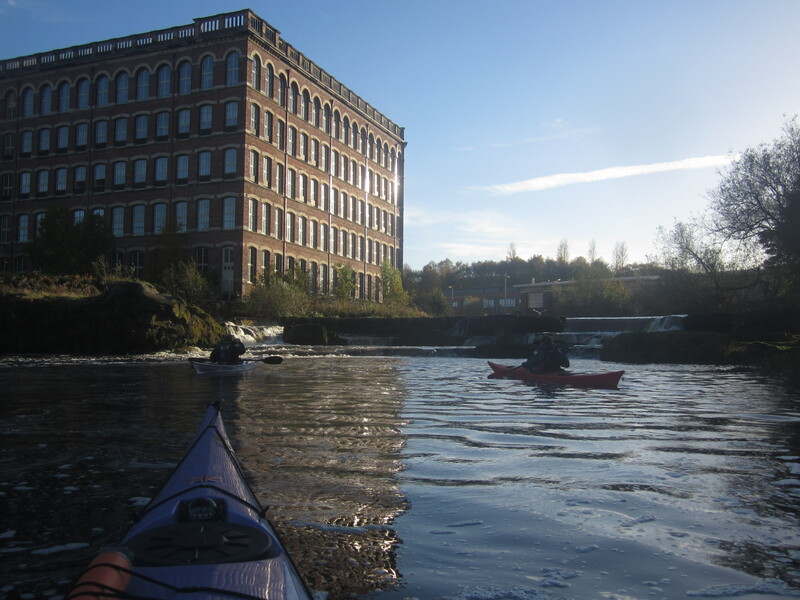 On entering Paisley there is a small overgrown slip on the left with a small grass area, the only place for a rest on the whole river. Timing on this trip is critical. In the 1960’s a shopping centre was built over the river beside Gilmour Street Station. In effect the river was put into two large long concrete culverts that normally only have a trickle of water through them. As Wikipedia puts it, the river was closed to traffic. 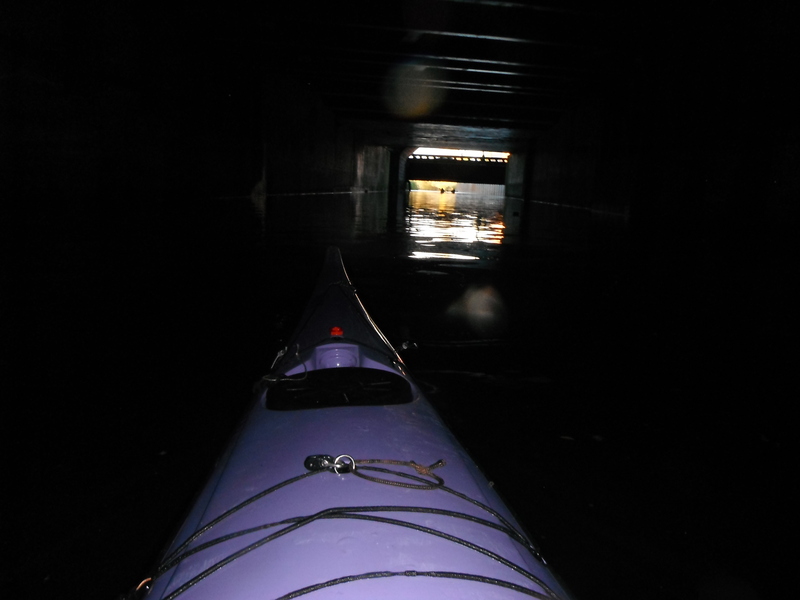 However for about 1 hour around high tide there is just enough depth for a kayak and 30 minutes from High Tide we passed through the dark, noisy left tunnel to emerge into Paisley Town Centre. 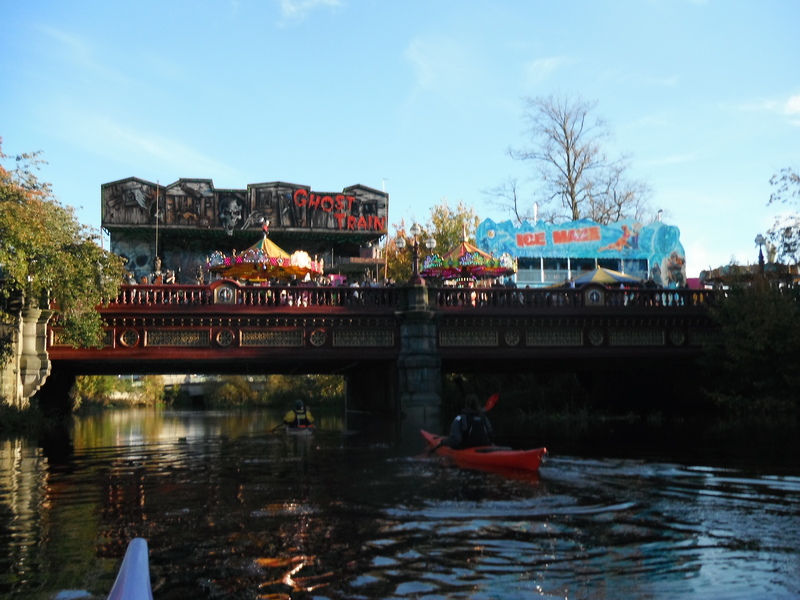 To our bemusement there was a fun fair across the next bridge; part of the Halloween Fair and the screams of the kids on the rides dominated. However a few more bridges took us into the relative calm of the mill pool just downstream of the rapids called the Hamills, the furthest point on our route. We took, with our very short break, 2 hours to get to the tunnel entrance (at 2.30) and spent about 30 minutes above the tunnel in Paisley. However the critical factor was now the light with sunset at 16:30. So we started back at 15.00 with the tide just about to turn. The journey back was attractive (on the way up we could not see it because of the dazzling sun) and uneventful. We turned up the Black Cart for about 1km under a lovely stone bridge, to give Mark a chance to have coffee right at the end of the runway. 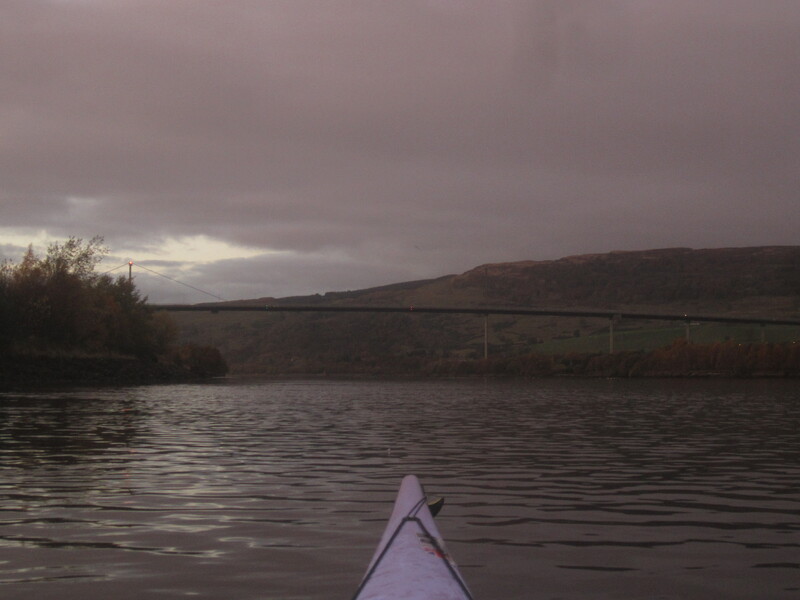 With the light rapidly fading we pushed on onto the Clyde and back to the bridge and the beach. 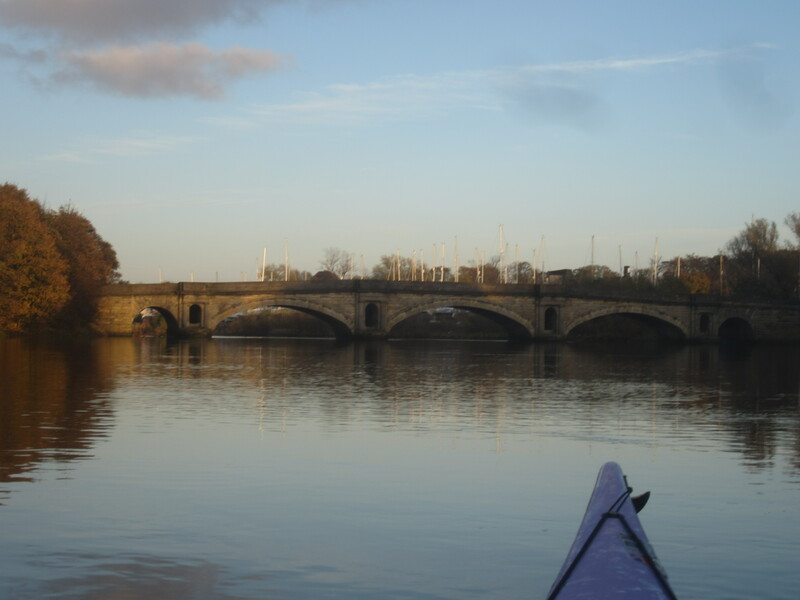 It proved to be a superb trip, full of interest and surprise and available only to paddlers. It is strongly recommended but our time allowance of 4.5 hours for the 20km would have been a major struggle for inexperienced paddlers. We suggest a start at least 3 hours before high tide and a high tide at least 3 hours before sunset (not 1.5hours! ).